Until the reign of George I, salvers were normally circular flat dishes and raised on a central spreading foot and often called tazzas. From the eighteenth century onwards, the central foot was replaced by three or four smaller swept feet near the border of the salver. 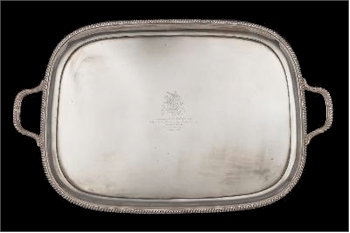 A typical Victorian silver salver (FS41/101), maker Atkin Brothers, Sheffield, 1897. Salvers were no longer just circular but could be oval, square or rectangular. Because of the large surface on a salver, it was an opportunity for the engraver to show his craft. Often decorated with just an armorial, the decoration to the surrounding surface became more and more elaborate while the use of scrolls, shells and foliage within the border became more profuse. A large George V Silver Serving Tray, maker Harrison Brothers & Howson, Sheffield, 1920 (FS41/35). 'Waiter' refers to a small salver, normally with a diameter of 7ins (18cm) or less. They are often referred to as card trays, as calling cards would be left on them by visitors for inspection by the householder. Trays did not make an appearance until the late eighteenth century. 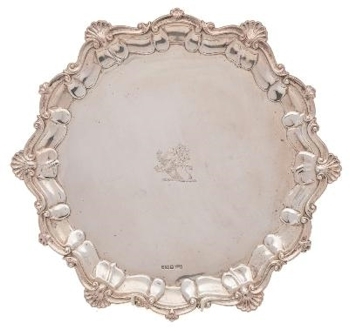 The term is used to describe a salver when it has two handles for carrying. Trays followed the same designs as salvers and, once again, it was an opportunity for the engraver to show his art. Often late 19th century trays had heavily cast borders and handles, often decorated with grapes and vine leaves, or scrolls and shells.